Big news broke out in the business world of the region. Two days ago biggest company in Croatia, Agrokor, signed the deal to buy majority stake in his main regional competitor, Slovenian Mercator. The new company will have more than 60.000 employees and around 7 billion euros of revenues which will bring them in the group of 10 biggest companies in the Eastern Europe. Technically, the deal is not finished since there are still some conditions to be met but it is hard to believe that something will now stop the owner of the Agrokor group - Mr. Todorić, from finally realizing his dream. As it is often the case, operational restructuring and merging of the two companies will take some time, but analyst believe that the joint company will be better positioned to fight against global competitors that are growing their presence in the region, and that the owners of the Agrokor manage to take advantage of the new synergies and benefits coming from the much bigger volume of trade. But this deal is not only interesting from the business perspective, but also from the political perspective. As said, Agrokor is the biggest company in Croatia, and Mercator is the second biggest in Slovenia, and as usual such inter-country deals brings some politics on the scene additionally fueled by the media coverage that is not always following business logic. Agrokor has tried for several years to buy Mercator, and he would probably succeed in it if the Slovenian politicians didn't stop the takeover. But this time, they couldn't prolong the sales of their problematic company which is for several years in crisis. It is a good start to look at the ownership structure, to better understand the background. So, who is the owner of Agrokor? The answer is simple, Ivica Todorić and his family through Agrokor have more than 50% share in all of the subsidiary companies. Ivica Todorić is the richest person in Croatian and region, and is frequently marked as a Tycoon by the local media. Word tycoon is here being used for someone who has amassed enormous wealth during the transition from Communism to market economy. And who is the owner of Mercator? The answer is not that simple, since the ownership structure till this takeover was complex. Mercator is, like Agrokor, a joint-stock company, but stocks of the company are held by the banks, other Slovenian companies, investor funds and individuals, with no one being the major holder. Nevertheless, the Slovenian Government had influential role in the ownership through its controlled companies which had stocks of Mercator or had stocks of companies that had stocks in Mercator. Such position allowed Government to prolong the sales of the one of the most important national companies for some time. The reason for such different ownership structure in two countries could be found more than twenty years ago. With the fall of communism, new democratic government in Eastern Europe took different paths towards transition to market economy. The path of Croatian government was to sell a majority of the formerly state-owned companies to private hands, usually to individuals and families with good connections to the ruling party. Basically, the old communist directors of the state enterprises were removed from their positions, bringing the new owners onto their positions. This has resulted in some famous fiascos, because some of the new owners haven't been capable of managing the large enterprises. But, some were more successful, one of them being Mr. Todorić who already had experience in the private business, and who has without doubt showed big talent at managing his large business. In Slovenia the transformation was different. Instead of giving socialist enterprises to the few families, the government privatized companies by redistributing shares of the companies to the former workers and managers. This move kept majority of the former directors in their positions, but also increased the influence of the politics in the economy, since the companies and management boards were interconnected with one another, with many important national companies, like banks, insurance, telecom operator, Oil Company, etc. still held by the government. Nevertheless, such system worked very well till, with Slovenia being praised as one of the most successful transition economies and as the country that should play the role of the bridge between Western and South-Eastern Europe. But, the current financial crisis also hit Slovenia. The construction companies were first to go down, with almost all the Slovenian construction sector going bankrupt. Secondly, with poor handling of the crisis by the Slovenian Government, a lot of formerly successful companies went into the problems, one of them being Mercator. Recently the government had made a decision to sell its biggest companies to the foreign investors. Several years ago takeover of the Slovenian company by its south neighbors would be surprising news, but Mercator's takeover was just the last in the series of similar events. On top of that, in Croatia the crisis in no less severe, with the standard of living going down and unemployment going up, but it seems that some of the companies have found the way to strengthen its position in the anticipation of the coming accession to the EU market. So, this takeover underlines the crisis in which the Slovenian economy (and society) is now. From the Croatian perspective, it is questionable how this takeover will benefit average citizen since the biggest Croatian retailer will now have dominant position on the market. From the business side, it remains to be seen how this acquisition will turn out. I personally have some reserves, knowing the difference in business culture, relationship to suppliers, business model and management style between two companies. Last month I blogged about a new trend in the business practices in the West - a trend to allow, or even request, their employees to bring their own mobile devices to work (laptop, smartphone, etc.) It didn't pass long before I encountered this novel approach, although in little different manifestation, in practice. As someone who regularly goes to IT classrooms and education, I was accustomed to the typical setup of an IT classroom: a bunch of PCs arranged in rows and connected to a local network and to a classroom server, usually located in the backroom. But, recently i received an invitation to the classroom in which an organizer has specified that each attendee has to bring his own laptop! And when you think about it, it makes a perfect sense. As I mentioned in my last blog, today majority of IT professional has their own laptop or at least can bring their official mobile device. Secondly, with advent of Cloud Computing you don't need to have dedicated Education server - you can simply lease one from several Cloud Computing providers and connect students' laptops to it through internet. And thirdly, you don't have to waste time with configuring user computers and reinstalling the PC image each time you have another group of students. This setup is especially attractive to smaller companies that don't have dedicated classrooms and staff for conducting education. After all, the main reason why someone will choose particular education is quality of an instructor, not an exclusivity of facility. Therefore, with such dynamic setup, smaller IT companies can harness the knowledge of their experienced workers who don't work full-time as an instructors, but without spending unnecessary amount of money in maintaining their own IT Classroom. For someone living in the "backyard" of Europe, it's always useful to follow news from across the ocean in anticipation of the trends that will, with usual delay of a few years, hit the coast of my region too. One of those trends is "Bring Your Own Device" policy that more and more companies in the west start to implement in their networks. To put it shortly, bring your own device is not some fancy way of inviting you to a party, but a model in which employer doesn't necesarily provide any more corporate laptops, smartphones, tablets and other electronic devices to their employees, but instead permits to their future or present employees to bring their own device to work. IT workers are divided along this issue. I will not going deep into the issues of security, compliance, manageability, etc. that frequently pop up in this debate. Let me consider this issue from a practical viewpoint. It's nothing unusual that businesses are always trying to find a way to lower their costs, especially in these times. And BYOD policy undoubtedly goes into that direction - it is clear that it shifts cost of buying new personal harware from company to the employee. Of course, you have to take into account the cost of maintaining tdhat devices, security and so on, but today when majority of mobile workers carry their official laptops to their home, I'm sure that those costs would not be higher than usual. Therefore, the BYOD policy is beneficial to the organization. It would be unwise to announce it radically: "From now on you must bring your own device to work", but gradually it can lower the cost of IT by letting employees to use personal devices in corporate environment. What about employees? I think there is not much to do but to be prepared to work in new circumstances. Looking at the positive side, you will be free to choose your own device you will work on and you might use one device for private and business purpose. But freedom comes with a price, you will have to pay for it, which is nuisance if you are looking for a job - employer can, and why not, ask you to bring your own device to work, similarly as he asks you to bring your own clothes or your own car to the work. Giving present circumstances, I would bet that most job seekers would accept those conditions. 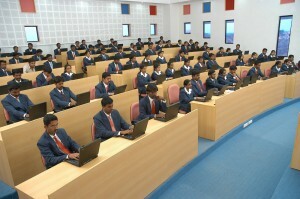 So, BYOD is an attractive proposal to the businesses, especially to the IT companies or IT departments. Although I didn't heard of any company in the region that is using this policy, I bet we will not need to wait for too long to see first signs of it. As I have already wrote on this blog, CRM in the cloud is all the rage now. All important software vendors in a CRM industry are offering their cloud solution, and some of them depend only on the SaaS business model. Microsoft is of course one of them, with their flagship product "Dynamics CRM 2011" being offered in the "on premise" and "online" model. But, few people know that Microsoft has another product that has characteristics of a CRM application, namely the Business Contact Manager for Office 2010. It is not cloud based, far from that, it is offered as an add-on for Outlook 2010 and cannot be bought separately, only as a part of volume licensing for Office. Although it's more of a contact manager application that enables small businesses to move all of their contacts in personal Outlook folders to one location, it has more advanced features that could classify it as a CRM application - opportunity management, marketing management and basic project management. It even has an offline capability, a feature that is lacking even in some professional CRM applications. On another hand, BCM has many limitations: it's bound to Outlook and cannot be used separately, it can be obtained only through an Office volume licensing (although, Microsoft has recently relaxed this requirement) and it has only limited customization capabilities. In spite of all of this, I found BCM to be very interesting to small businesses that are already using Microsoft Office. It seamlessly integrates with Outlook, offering well known environment to the user and it works very well as a contact management application without overwhelming user with features he basically doesn't need. Unfortunately, the future of BCM seems to be questionable at best. Microsoft is obviously not paying much attention to further development of this product, which can best be seen if you visit official BCM blog, that hasn't been updated for more than one year. I would not be surprised if Microsoft doesn't continue to offer BCM with his next version of Office. It has already done similar thing few years ago when he discontinued the Office Accounting - a basic accounting package which was offered in almost the same model as BCM. Microsoft is obviously using such add-on products to boost the sales of Office, but as long as they don't endanger their other products. In the case of BCM, it is in some sense the competitor of Microsoft Dynamics CRM, so it would be logical, and desirable from Microsoft's point of view, that current users of BCM gradually move to Microsoft's online Dynamics CRM. It remains to be seen what will happen - will BCM continue to exist, or it is living his last days. 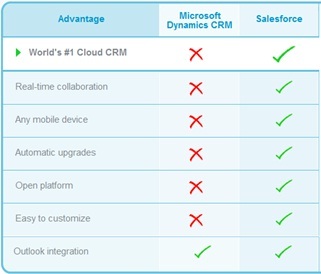 Until then, BCM is living in some kind of Limbo, stuck behind the CRM cloud. The Microsoft's purchase of Skype at outrageous purchase price of 8.5$ billion is already the old news. There were many speculations at what is the Microsoft's plan with his new acquisition, is it ingenious move not recognized at the moment, like Microsoft's investment in the Facebook, or is it yet another blunder by the software giant. But, by now the dust has settled down, and as always the time will tell was it the good idea or not. But, of course, Microsoft for sure has in plan to integrate Skype with his other products. He already has software for conferencing, phone calls and collaboration - Microsoft Lync, but through Skype they will be able to reach much larger customer base and to strengthen their position in the mobile market. After all, telephone and data networks are already integrated, and why not to have the same communication software on your mobile phone, fixed phone and personal computer? One interesting integration is integration with the Microsoft Dynamics CRM. There have already been comments on that issue, and I think that such integration will give addition strength to the CRM offering, but not much. It would be cool for Skype and CRM users to automatically call a contact from their CRM windows, or to automatically record a time and duration of the skype call, but such integration already do exist, although through third-party tools, and is not expensive. Call centers are important users of phone integration, but such establishments use IP telephony and specialized software for the calling, and usually it can also be well integrated to the CRM. Therefore, out of the box integration with Skype would be nice feature, but not crucial. Our marketing professor at MBA studies used to say: "You can always find a market where you are a leader, if you define market accordingly". A similar wit could be applied to comparing one product to another: "You can always find that your product is better than competitor's if you define criteria accordingly". This chart has of-coruse caused a response from Microsoft, primarily from Microsoft parners and bloggers. They have presented evidence that this chart is misleading and plain wrong. The most erudite was a blog from Sonoma partners, one of the leading Microsoft CRM's partners, in which they have analyzed and refuted each of the seven claims that Salesforce has presented. You can also look at the link where the graph was published, but I'm posting the graphic, so not to lose the original chart if the Salesforce choose to tweak it once more. Now, not knowing anything about Salesforce or Microsoft, you can notice that Salesforce has changed a criteria a little bit, and most interestingly, they are now more generous, as before they were better on all 7 points, and now they are better on 6 points, with Outlook integration being listed as a feature which both products support. Curiously enough, the criteria they have chosen to eliminate in the first chart, "any email app", to be acknowledged as equally supported on the second chart, "Outlook integration", is the one on which they had the best chance of claiming their advantage. It is truth that Microsoft's CRM works great with their most popular mail client - Outlook, but it is also truth that it doesn't have out-of -the-box integration with other mail clients, like Lotus Notes or Gmail, where Salesforce supports all three clients. The customer who doesn't use Outlook as their mail client has to pay for the third party add-on like LinkPoint360 to have the integration. Now, I'm using all three mail clients and in my opinion the Outlook is clearly the best, and globally it's the most popular client. But, of course, not everyone will share my opinion, and in many situations the change of mail client is not feasible. But, of course, such comparisons are almost never intended to be as accurate as possible. Their main aim is to persuade the potential buyer to choose our solution. And one can well imagine the reasoning of a Salesforce's employee who was responsible for re-crafting the chart: "what is more convincing, seeing a chart on which we are better from competitor in every single aspect, or seeing a chart in which we are better in every single aspect except in one in which we generously give the credit to the competitor? No one is going to believe that we are better in everything, so, to make things more realistic let us concede that just somewhere Microsoft is on equal terms with us." 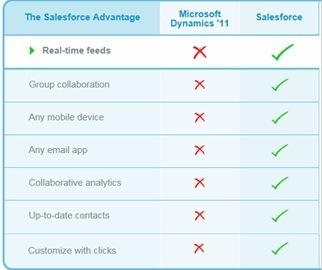 I don't want to say that Salesforce is deceitful company, Microsoft also has his own fair shares of marketing bluffs and such misleading comparisons are typical in Software industry. Both products have there own strengths and weaknesses, and the buyer has to go much deeper into each product to rightly decide which one is better for him. But, Salesforce's marketing department could have certainly done a better job of promoting advantages of their product to the competitor's. I have finished my second marathon! This time in Vienna! After my first marathon two and a half years ago, and a period of reduced level of physical activity, I decided to prepare for my second marathon. Since this time the marathon was held in the spring, I had to excercise during the winter, which proved to be more difficult due to the weather conditions. Nevertheless, I finished it, without any injuries or exhaustion, but I cannot be happy with my race netto time of 4:23:48, which is mediocre at best, even by amateur standards. I promised to myself that the next time I will again run the marathon under the 4 hours! Apart from that, the Vienna marathon is one fine example of excellently organized sport event. Even with more than 30.000 participants, there were no delays in any part of the event, from registering and issuing race numbers, to the delivering of medals and refreshments. Adding to that the nicely designed course that goes by most of the landmarks of Vienna, and rarely repeats itself, you get the Marathon that is worth taking part in. MBA IEDC graduate, with rich experience in IT industry, trying to bridge gap between business and IT.